Gordon Bennett was an Australian artist of Aboriginal and European descent who, conscious of the colonist designation of 'self and other', identified as neither. Bennett articulated cultural fluidity in contemporary society through a post-modern practice characterised by appropriation from many sources that repositioned and questioned notions of the authentic and original. To this end, he 'questioned' through the pluralist nature of his work the representational frameworks of national narratives and mythologies presented in history books and museum displays . 'Home décor (after M Preston) #18' 2012 belongs to Bennett's 'Home décor' series which he began in 1995, but expanded upon in 2010 - it is one of the last paintings that he produced before he died in mid-2014. Bennett's overlaying of Margret Preston's 'Aboriginalised' imagery with early 20th century De Stijl compositions signalled his engagement with the history of 20th century 'primitivism', of western artists enriching their practice through drawing on non-Western traditions. Bennett located Preston's appropriations within this globalised context as well as positioning his own practice within this context through his reappropriations. More recently, Bennett had begun working with Preston's 'translations' of taphoglyphic and shield patterns that were featured in an article in Art in Australia in 1925. 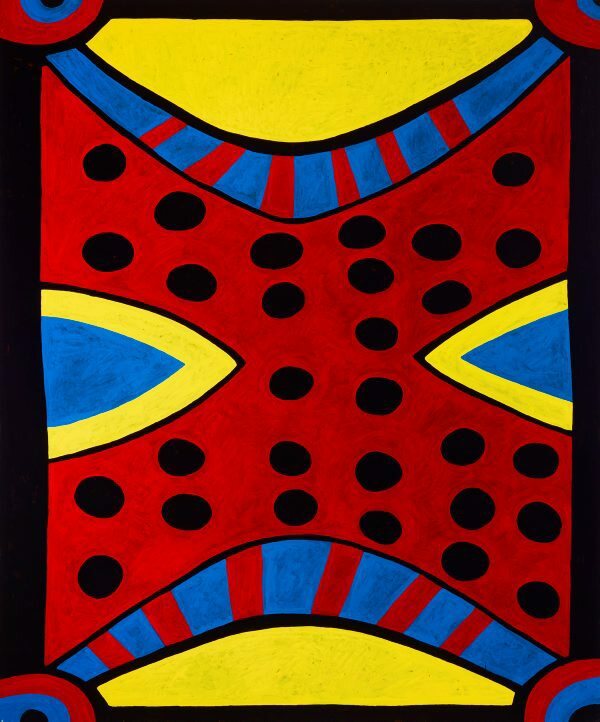 Preston is recognised as the first white Australian artist to endorse and integrate, somewhat superficially, indigenous Australian designs for domestic use under a misguided pretence of 'nationalist primitivism'  during an era notorious for the pacification and mistreatment of the indigenous population. Despite being enlarged and reorientated, Bennett's 'Home décor (after M Preston)' #18 is a relatively faithful copy of Preston's 'Design from a Goolmary shield, North Queensland' 1925 which she instructed was 'not adaptable for continuation or repetition. May be applied in mats, cushions or splash mats' . Bennett's bold, strongly coloured and energetically painted enlargement and re-contextualisation of Preston's appropriation invites us to contemplate the moral dilemmas and sensitivities of cultural ownership and plagiarism that are as relevant today and as they were last century. Further, this work expands Bennett's exploration of the tensions between modernism and the periphery in the 20th century, and between authenticity and copying, through enacting a reverse synthesis of modernist 'primitivist' appropriation. Signed and dated u.r. verso on canvas, black/brown fibre-tipped pen ".../ Feb 2012/ .../ G Bennett".